May | 2012 | Knit & Run! May 2012 – Knit & Run! No one said life would be easy. I know that. I thank God every night for my blessings because I do know I’m blessed with abundance beyond measure, but every night and every chance I get, I make the effort to recognize how blessed I am. I have yarn all over the house. Okay, so even I’m starting to look around thinking, “Maybe this is a little too much.” But it makes me happy and I use it to make things that make other people happy. There’s food in the refrigerator. There’s no question in my mind, if we were snowed in for a week and the power stayed on, we’d stay fed. I have a job. It’s not a career but it keeps said food on the table, the roof over our heads, and my car in motion. It’s also allowed me the time to be home with the boys for longer than people who work ’til 5 or later, and believe me, that’s made a HUGE difference to me. The boys are great people. Last week I heard it from two different people who don’t know each other and couldn’t know that it would leave me grinning from ear to ear for the rest of the day. It’s nice to hear when you’re really not sure if you did any of this parenting stuff right. I’m losing weight, I look good, I feel great (not counting my knee), and I can run. There are some days when running is the only thing that saves my sanity. Like today, for instance. So I know damn well I have no right to feel blue, and yet here it is. I’m keeping up a good front when I’m around people, but underneath it all, I can’t quite shake this feeling that I need a good cry. I don’t want to. I gave in and cried not too long ago—in the shower, where no one could see me and when I got out, the redness on my face was easily explained—and it didn’t help because when I got out of the shower, I couldn’t stop crying. A crying jag is not the kind of genie that goes easily back in the bottle. I know what it’s about, too. I’m lonely. The boys are here, but they don’t need my problems. They have no idea and I’m keeping it that way. I’m lonely as hell, and no one knows. Well, now you do. Sorry, but I also know that if I’m having this problem, I’m probably not alone in it, and that’s the ONLY reason I’m sharing this. Not to go by the “misery loves company” cliche, but as often as I tell myself this isn’t forever and somewhere out there is the one I was meant to meet but didn’t; these days of loneliness are numbered and dwindling; I just need to hang on ’til they’re over and what follows will be so much love and peace and security that the rest of it will all be worth it. I just want to be happy, and I know I should be happy. I have all the ingredients to a happy life that anyone else would love to lead. So why am I not happy? No, that’s not true. I am happy. I know it. I’m blessed. I’m just…missing something. Whoever you are, get here soon. Please. Let me back up. Once upon a time, I was sure he was The One. I won’t go into why, simply because we’ve all been there, and I’d rather not reveal details. Much better for all if he stays anonymous, and if you think you know who he is, keep it to yourself, thanks. Trust me, even he doesn’t know, or at least, I don’t think he does. I’d rather not know if he does know. Know what I mean? Fast forward many years (>20), during which time my life went on, as did his, and here I am, sitting in my car, life going on, not-so-fat & happy. A song plays that takes me back to hearing him sing it. We were both younger then, and I had a lot to learn. To my surprise, I didn’t get the old palpitations like I once did at the memory of him. In fact, it occurred to me that I’d probably never see him again. I’m actually fine with it. That surprised the crap out of me. It’s been a long time, but I’m ready to let him go. The Real One is out there somewhere, and I trust that we’ll find each other. I’m taking the Leap of Faith. Until then, I’m all about learning, living, loving, and laughing. No problem. In both cases, I’ll find The Right One. …is new again, starting today! I realized that my life is under renovation. Clearly my blog is way overdue. I started with a hair color and cut, which I love. I think it fits my face, which is among the parts of me that have dropped 30 pounds since September 2011. Anyway, my personal best mile is 13:07 so far, but I aim to shrink that. When I break 10 minutes, I’ll think about that marathon. So far, no varicose veins, either. I’m also focusing my energy. My BFF, Hope Ramsay, restricts herself to one knitting project at a time. I don’t know how she does it when there are so many awesome places to get patterns, starting with Ravelry. (If you’re not signed on to Rav, you should be. Seriously. It’s social media meets crafts addicts anonymous. Wonderful place to go.) But we went to Maryland Sheep & Wool earlier in the month, and I got more yarn to finish a project I’d started, and there was so much wonderful yarn left that I couldn’t let it go to waste. My other BFF, Laura Graham Booth, suggested I make myself some fingerless mitts, which was a brilliant idea considering that once summer sets in, my office a/c system goes into hyperdrive. 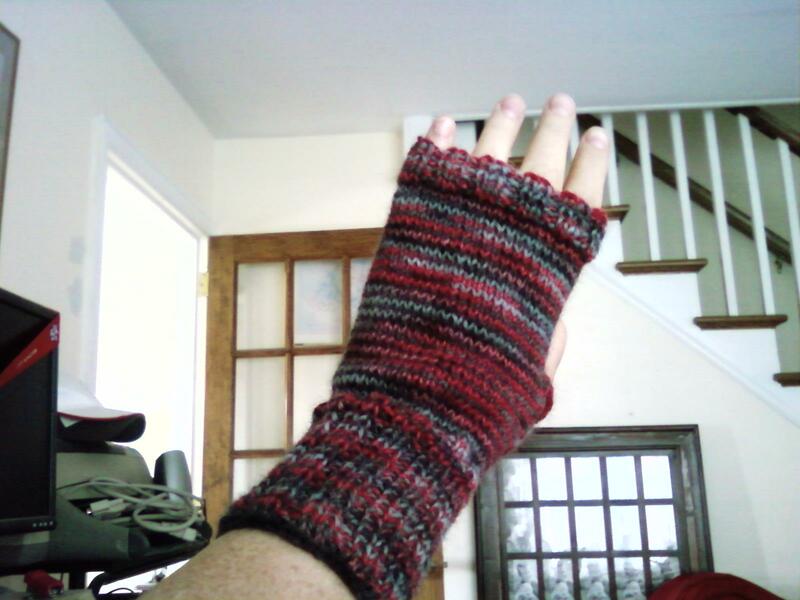 Six days from casting on, I had a pair of awesomely lovely mitts. Lastly, writing. It’s not easy finding time for it, but I’m still managing. My incredible critique group, The Lalalas, is holding a 100 words/100 days challenge, and the prize is coming from me: a pair of hand-knitted slippers in the colors of the winner’s choice. I’m thrilled people are really busting their tails to earn them! Sigh. Anyway, if this is your first time here, Welcome! And if you’ve been here before and you’re wondering WTH happened, Welcome back! I’m glad you’re here! Apologies for being absent last week, but my PDJ (pesky day job) required I attend three straight days of “process improvement” meetings. It seems a misnomer to me to kill three days of productivity to work on improving my productivity, but maybe it falls under the same heading of “You have to spend money to make money.” Whatevs. I didn’t fall asleep in the conference room so I consider that a victory. Trust me, it wasn’t easy. I still can’t figure out how I got through four years of college, and I only ever dozed off in Philosophy class. I’m debating some major changes to the blog. My life is undergoing renovation; maybe my blog should too. There’s also the question of whether social media has made the blog irrelevant, but I’m sticking with this. I’m going to need a website when the time comes, so here I’ll be. But I know people who blog or maintain websites on themes. Given that I enjoy more than just one thing, I feel like my site should reflect that. My first thought is on the title. I’m thinking “Knit & Run” for a title, since I love to do both, though I find it curious that one hobby involves sitting for long periods of time, and the other is quite the opposite. But then there’s writing, and autism issues, and life, and reading, and… But for now I think I’ll go with Knit & Run for a title. Tomorrow I’ll post the pic of the mitts I just finished, and the story to go with them. They opened my eyes in more ways than one. By the way, if anyone knows how to get rid of spammers, I’m welcoming ideas. I may have to delete my “Brotherly Love” post because when I logged in today, I found 28 morons had tried to sell me crap or convince me to click their link. Not sure where to start this one. I had a post in mind but then the news broke yesterday about Junior Seau, and I have to say, my heart’s still a little broken. I got into football before he started in the NFL but he’s one of the reasons I really got into it. He played with heart and soul. He was one of those players who really left it out on the field. I admire that in people in general. This morning I was trying to catch the score of last night’s Ranger game (I fell asleep in the 2nd OT intermission; go Blueshirts!) and ESPN showed an interview with Marcellus Wiley. Big as the guy is, he started to lose it when he talked about Junior and what an amazing person and athlete he was, and how hurt he was to know Junior couldn’t open up to the people who cared about him. Seeing a big guy like that nearly in tears? It’s not easy to watch, and it brings a lot of emotions to the surface. I’ve heard it said Marilyn Monroe inspires fantasies in men and women alike: both genders thinks if they’d just known her, they could’ve saved her. Junior Seau could be the same, though I suppose his influence isn’t as far-reaching as Marilyn’s. Which brings me to my point, because I do have one. 🙂 We all need to take some time to figure out who the Juniors and Marilyns are among us. It’s not easy to see. We hide well behind our “sure I’m fine” façades. Rather than live with regrets when it’s too late, why not say something nice to someone, just to let them know you noticed and you care? It could make all the difference. And if you’re a Junior or a Marilyn, I want to let you know I care, and if you need to talk, I’m right here. I don’t judge, and I’ll do what I can to make you laugh. Now that I’m learning and growing, I promise to come to you when I need your help too, because the song is true. We all get by with a little help from our friends and family. Rest in well-deserved peace, Junior. We’ll miss you.